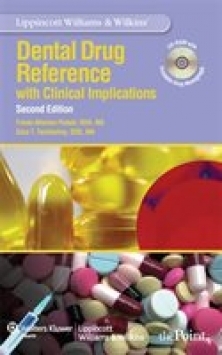 Written for dental professionals, the Second Edition ofLippincott Williams & Wilkins” Dental Drug Referencequickly resolves questions and concerns that arise during patient consults, helping you design appropriate and safe oral health care treatment plans. It focuses on drugs that you”re likely to encounter reviewing a patient”s medical history as well as drugs that are prescribed for the management of orodental pain, oral infections, and common mucocutaneous conditions. A bonus CD-ROM offers all drug monographs from the handbook in an easy-to-use, searchable format plus printable monographs for inclusion in patient charts. You”ll also find an image bank with full-color photographs to help you identify adverse drug effects and oral conditions.